Fresh bread is possibly the best thing on earth! Whenever I have bread baking, I always seem to draw a crowd. With recipes like this I really can’t blame folks for gathering! Pull-apart breads are great for folks who struggle with creating pretty loaves of bread. These breads are best when they look messy. So you haven excuse not to make this one! 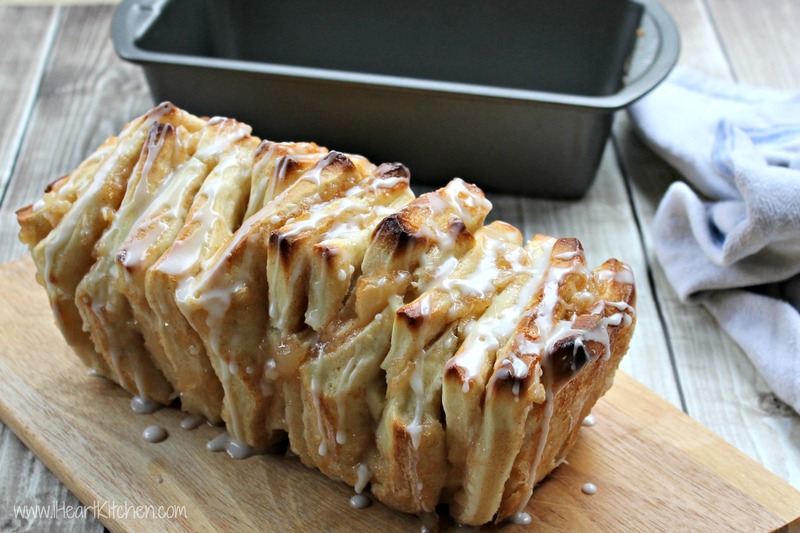 This bread is like a combination apple pie and cinnamon roll all rolled up into one delicious treat. The best part is that it’s messy and gooey and everyone can’t help but dig in. Add the dough ingredients in the order listed into your bread machine. Select dough cycle, start and allow the dough to run the full cycle. Once the dough has completed the cycle, remove to a lightly floured work surface. Cover with a dish towel and allow to rest 10 minutes. Once the dough has rested, roll it to a 20" x 20" rectangle. Dice the Comstock apples and mix with the cinnamon, then spread over over the dough. Use a pizza wheel to cut the dough into 2"x2" squares. Line two loaf pans with parchment paper. Stack the squares into small piles and gently place the piles into the pan sideways. Continue this until each pan is full. Cover with a tea towel and allow to rise for 30 minutes. Bake the bread for 25 - 35 minutes or until golden brown. Remove from the oven and cool on a rack, peel away the parchment paper while warm. Make the glaze by mixing in the vanilla then gradually adding the milk until the glaze is a thick pouring consistency. Visit Michelle @ iHeartKitchen.com's profile on Pinterest.